One of the most important reasons to be a connected educator is that it allows us to have a voice in conversations that matter. If you are digitally literate you enable your voice to be heard in important conversations on a local, state, national, and global level in ways that were never possible, just a decade ago. if only policymakers like our education secretary were hearing from actual educators like [Deb Meier, Chris Lehmann, Angela Maiers, Dennis Littky, Will Richardson, or whomever you admire] maybe they would have a better handle on what our students really need for success? Instead, we know from media reports that typically, educators do not have the ear of such policymakers. Sure, there may be a PR event here or there where educators are tossed a bone, but we rarely hear of sustained, ongoing conversations between educators and those in charge of what is happening by those who make the decisions. Connected educators know that there really is no good reason for this, and social media is starting to break down those walls. They are doing great work and not afraid to share it far and wide. They are publishing books, contributing articles, blogging, commenting on education stories, connecting in social networking groups, speaking to audiences live and via video (i.e. TEDxEd), and, of course Tweeting about what they are doing. Unfortunately, it is rare to hear that policymakers are a part of these conversations. Duncan is not just talking the talk. He’s walking the walk. This week he picked up his game and I don’t mean on the basketball court. He actually began following some of education’s most influential Twitterati. I was tipped off when the following came up in my Twitter feed. Uh oh! What did I do now? Why is he following me??? He has more than 100k followers, but follows less than 200, so, I looked at his follower list, to see who makes the cut. Was it troublemakers or thought leaders or something in between? When I got there, I thought I made an error. Troublemakers? Well, yes, but in a good way. It seemed a mirror copy of my follower list. I was confused. It was all those folks I only wished people like Arne Duncan was connected with and I know almost all these people. 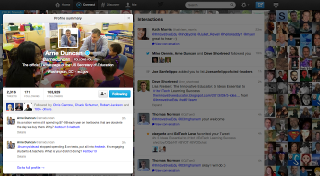 How was it I never knew Arne Duncan was one of their Tweeps? Us connected educator types often lament the fact that we don’t have much interaction on social media with those at the education helm. Was Duncan on a mission to change this perception? I wasn't sure and I still wondered what prompted the follow?I looked around a bit more and discovered#edchat creator and connected educator extraordinaire, “Tom Whitby” had suggested that Duncan begin dipping his toes into these connected waters and provided him with a list of about100 Twitterati who had a prominent voice in education. Twitter was abuzz with all these connected educators starting to realize that we were talking and our country’s head of education was ready to listen. What did we want him to hear? What don’t we want him to hear? Does this change everything? Whoa! Still, when the U.S. Secretary of education is watching, you can bet educators are going to be on their toes working even harder to have powerful conversations that capture ways we are hoping to make a difference and affect change. Tom Whitby: @ransomtech About as much as you can expect that assurance from anyone who follows you. Stephen Ransom: @tomwhitby Just thinking out loud here… that following is one thing. Participating is another. If Duncan takes his participation to that level, it becomes evident that he's done more than join the club, he's actually interacting as a member. What's more he's not doing so because people are yelling, screaming, or mad as hell, but instead he wants to hear and respond to what they have to say. When that happens, we will indeed be moving toward the type of conversations necessary to enable this country to transform education in powerful ways. Oh, and if you’re wondering what my first DM to the U.S. Secretary of Education will be, it will be thanking him for hearing us, inviting him to interact, and providing a link to this post.